The 6th November has always been an important date in my calender, as it’s the Birthday of my Mother. 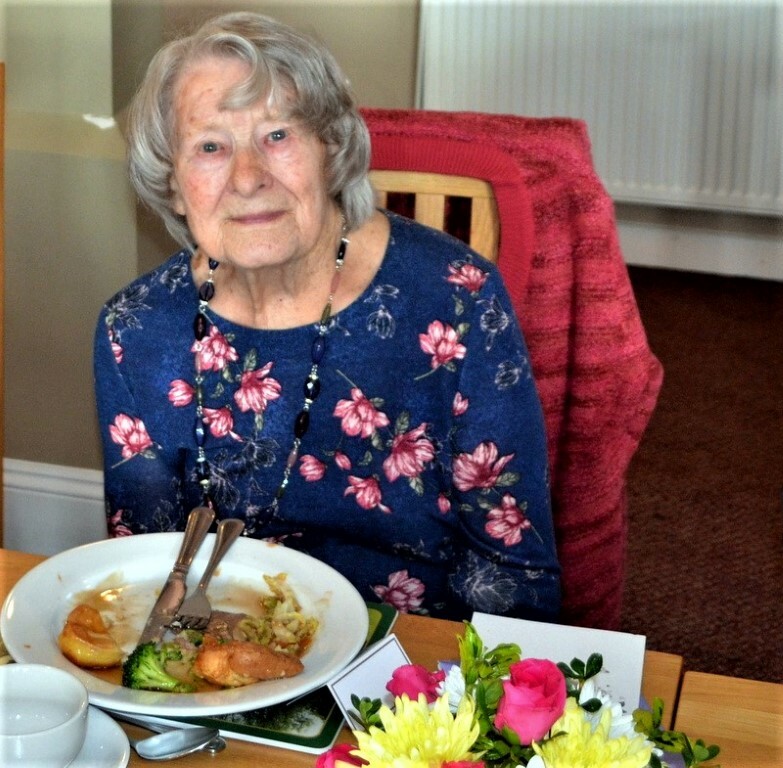 This year, she turned 90 years of age and a special celebration party was being organized by my sister Anne. So, instead of heading to Charlotte, NC this year for the Dirt Track World Finals, I would be heading for Oxfordshire, England. On Wednesday 31 October (Halloween) at 10-20 pm , I took off from the Ottawa Airport bound for London , Heathrow. The overnighter arrived at about 8-30 am, GMT , this being one of the rare times of the year where the time difference is only 4 hours. From the Central Bus Station at Heathrow, I caught the coach to the ‘Park and Ride’ in Oxford. 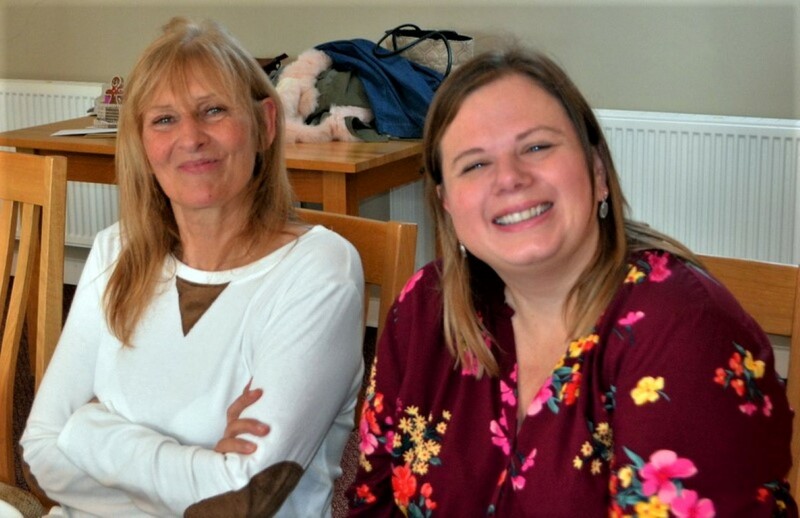 There to meet me was my sister Anne, who drove me to her place in Milton Under Wychwood, Oxfordshire, where I was staying with her and my brother in law Pete. 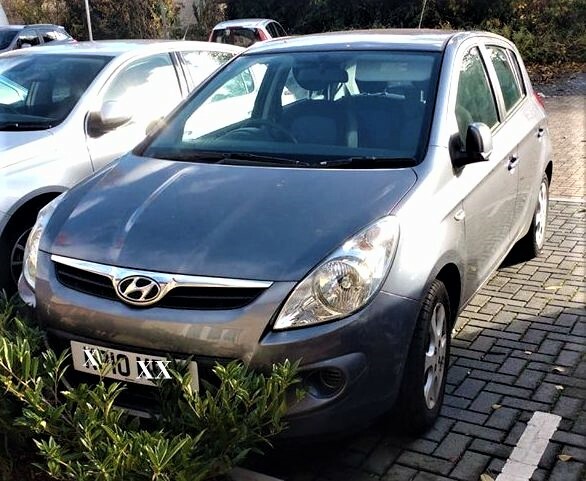 Instead of picking up a rental car at the airport, for this trip, Anne was able to arrange for me to be ‘added’ as an extra driver on mums Hyundai car insurance. Yes, Mum is still driving at her age. I didn’t get much sleep on the flight, so for the rest of Thursday and part of Friday morning I spent time catching up. During the afternoon, I took mums Hyundai for little drive to nearby Chipping Norton. 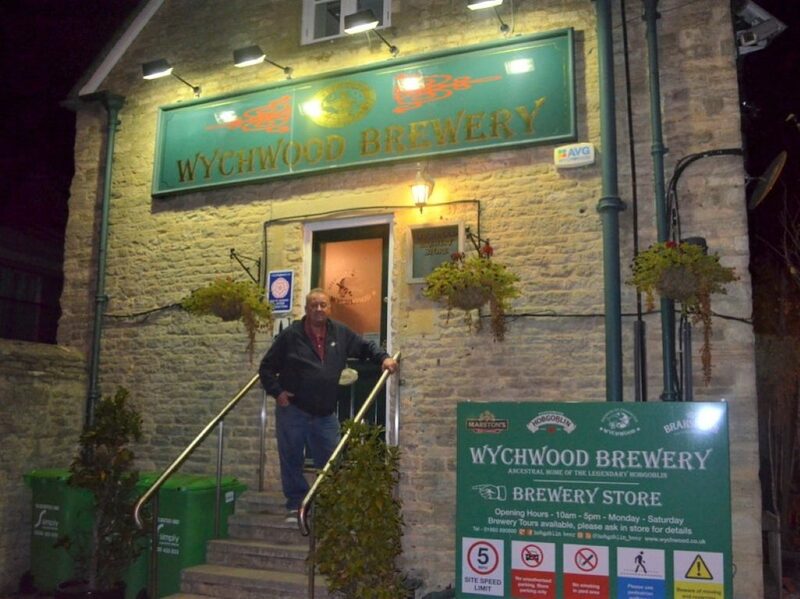 On Friday night (2 Nov) Anne had got me booked to have a tour of the local Wychwood Brewery in Witney. Their world famous , Hobgoblin beer is one of my favorite brews. 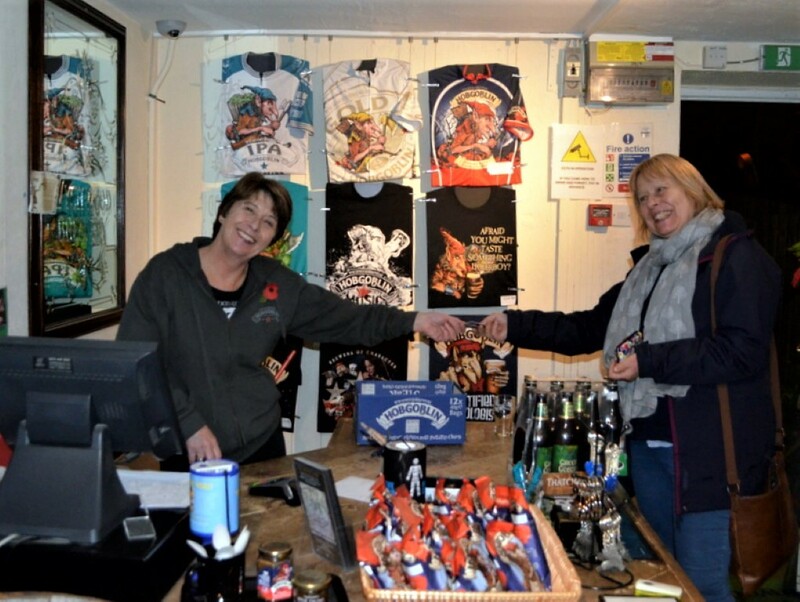 Anne acted as my chauffeur, so I could try a few samples. 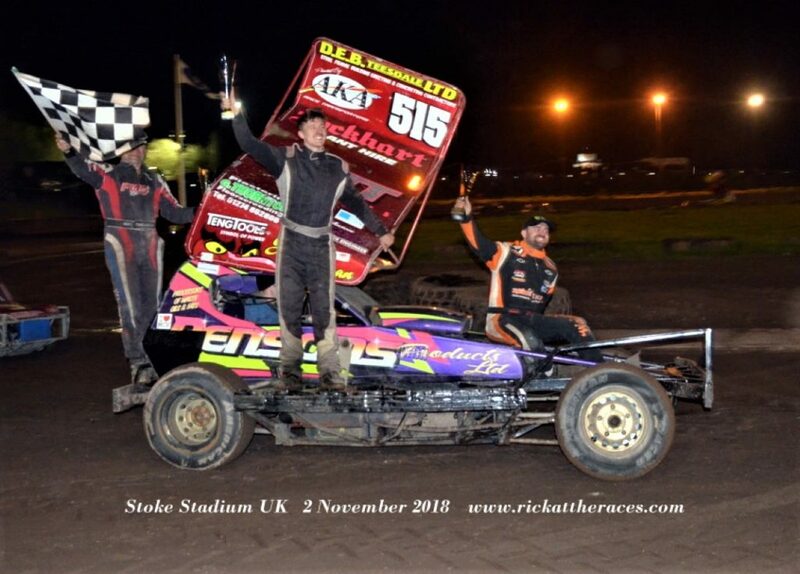 On Saturday (3 Nov) I had arranged with my buddy Robert Sellar, who lives nearby, to go on a racing trip to the Stoke Stadium, so he picked me up from Anne’s mid morning. 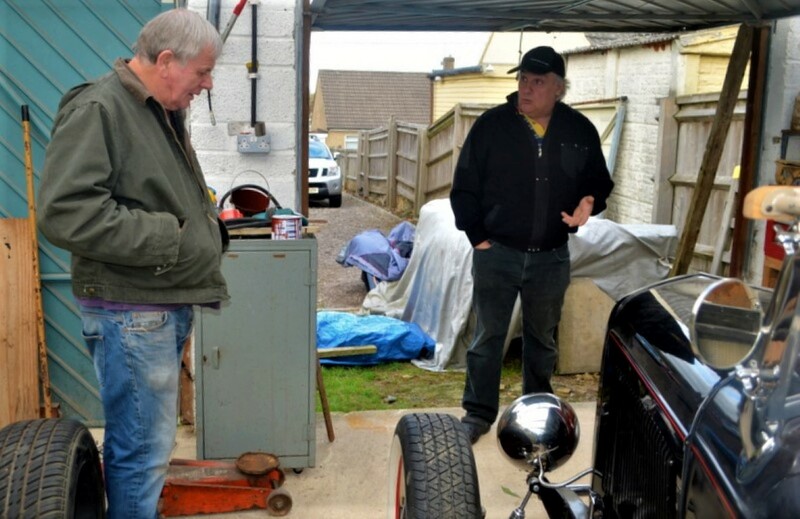 Robert restores and builds heritage stock cars and on the way there we dropped into former BriSCA F1 driver Stuart Silman who lives in nearby Chipping Norton. Robert needed to get some info on a project he has in the pipeline. 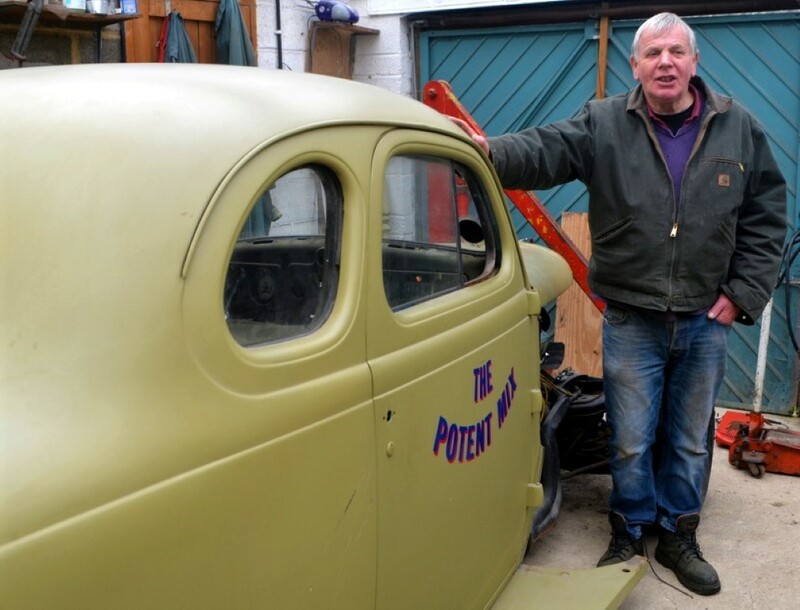 Since Stuart quit racing at about the same time I did, he’s been into street rodding so we had a good look over a couple of the cars he was working on. We spent an hour or two chatting , before continuing the drive up to Stoke. It had been 42 years since my last visit to the Stoke Stadium, when on that occasion I was there helping out my late friend Brian Holmes # 542. 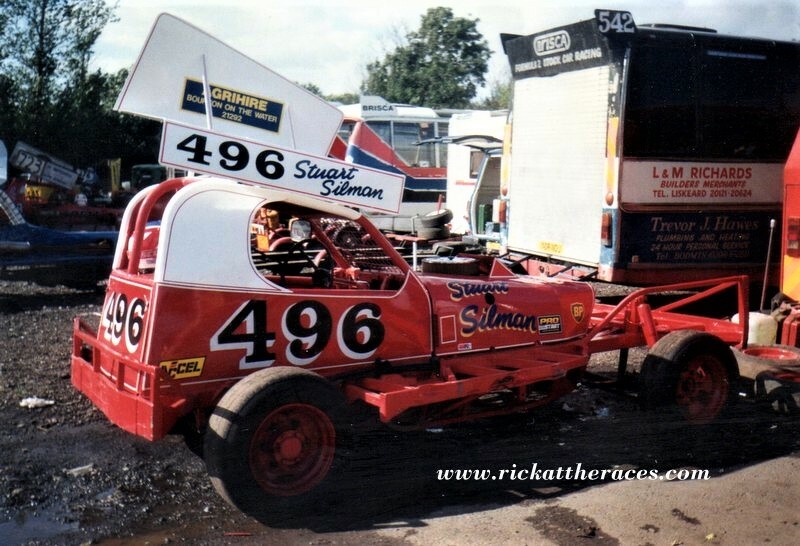 It was a Saturday afternoon F2 stock car meeting and, I remember that after the races, we carried on to the Long Eaton Stadium to watch the BriSCA F1’s in action. 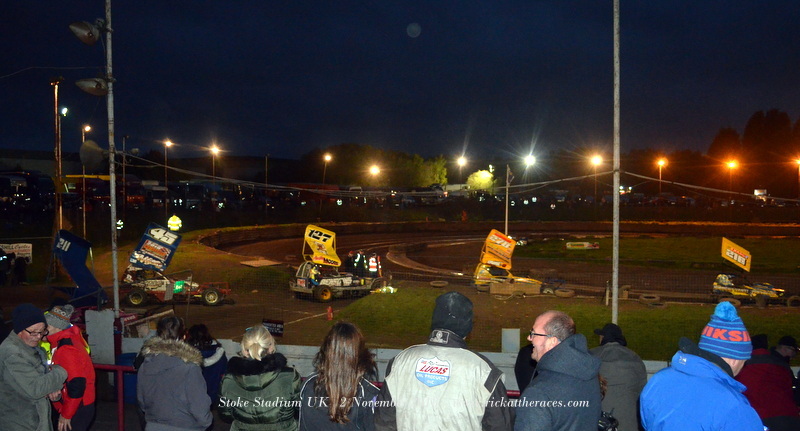 The Stoke Stadium, at Newcastle Under Lyme in Staffordshire was opened for BriSCA F1’s in early 1973 by promoter Mike Parker. I missed the opening day because it clashed with my local Brafield track, but I was there for the second one on April 29th. 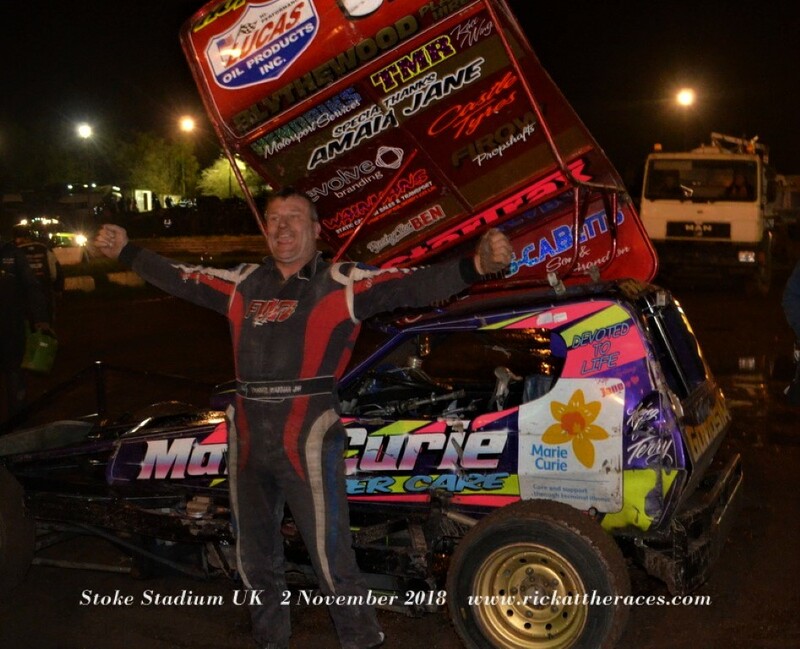 I recall sleeping in the car at one of the M6 Service areas after attending the races at the White City Stadium (Manchester) the night before. On this occasion, it was just a three hour drive from Anne’s place. We arrived in time to have a walk around and chat. 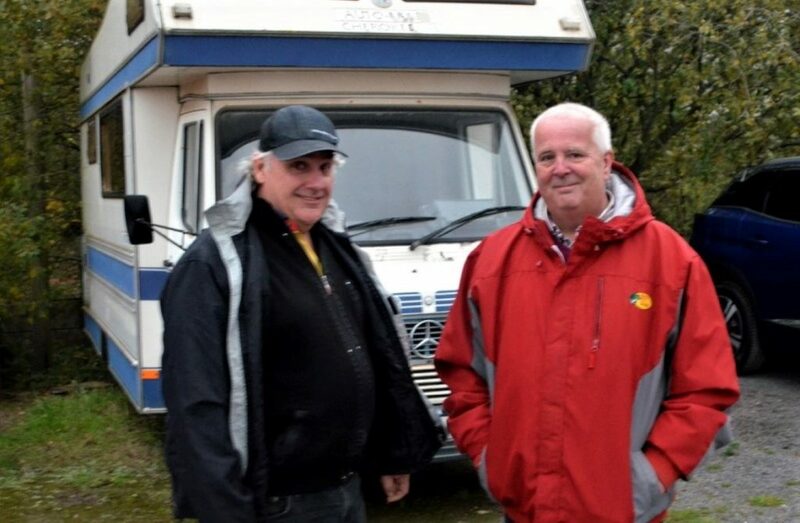 The first person we came across was present day Promoter Steve Rees. 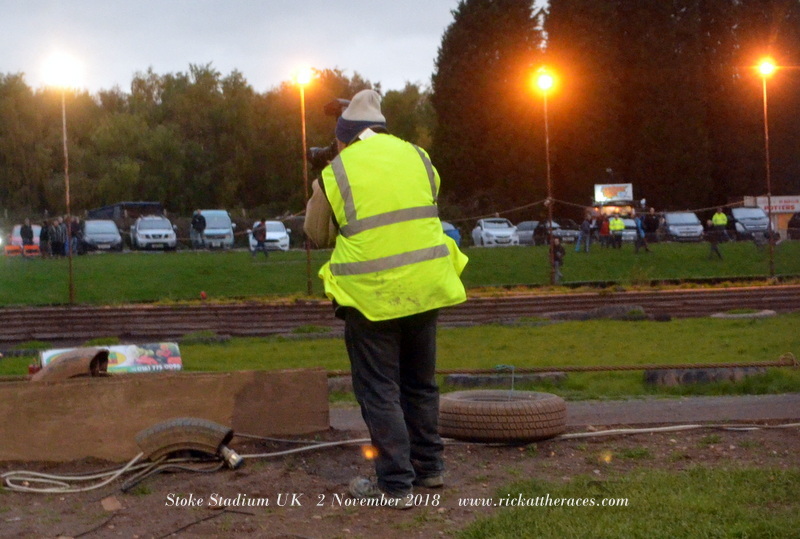 It wasn’t long before we spotted my ‘Tog’ buddy Colin Casserley out on the track taking pics. A lot of work had been done over the years, and the place was a lot tidier than I remember. 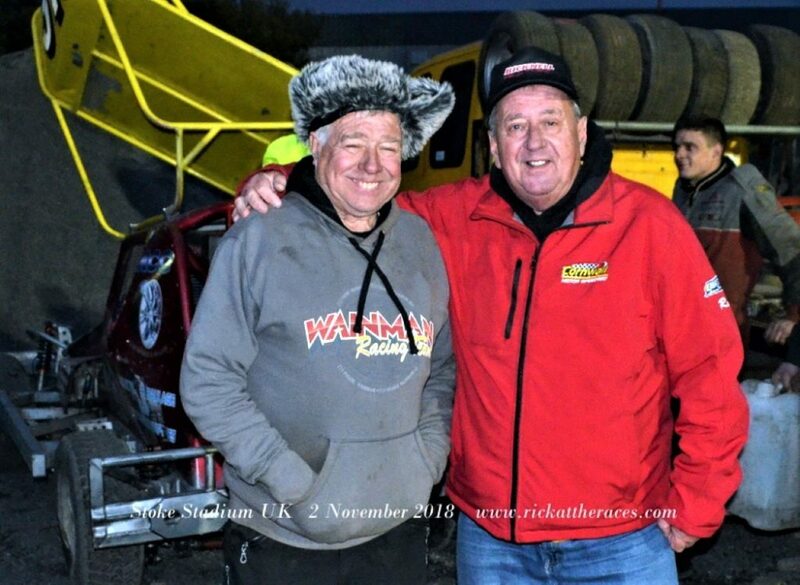 While roaming the pits I bumped into the legendary Frankie Wainman, and driver Paul Hines, the son of Derek, an old friend of mine. I also made time to chat with old friends Paul and Joan Jenkins who were busy selling stuff at the Magazine booth. I came across many other old friends, too many mention by name. 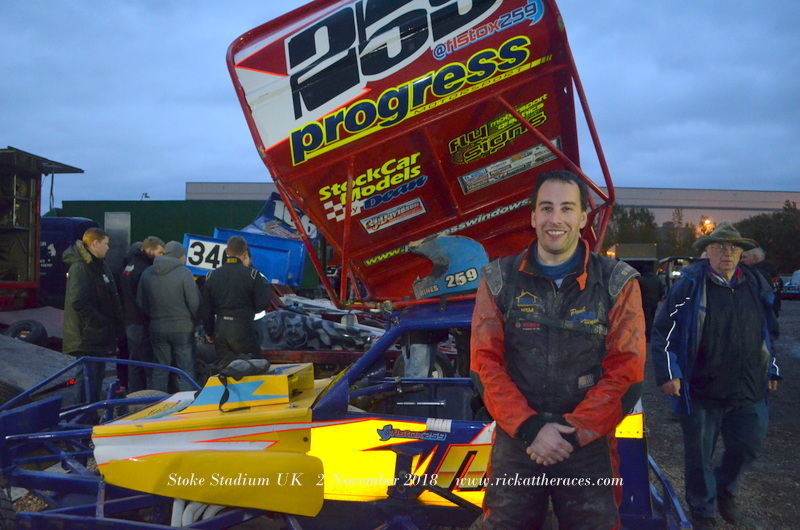 It was Frankie’s son , Frankie Jnr that won the evenings big race, for the BriSCA F1. 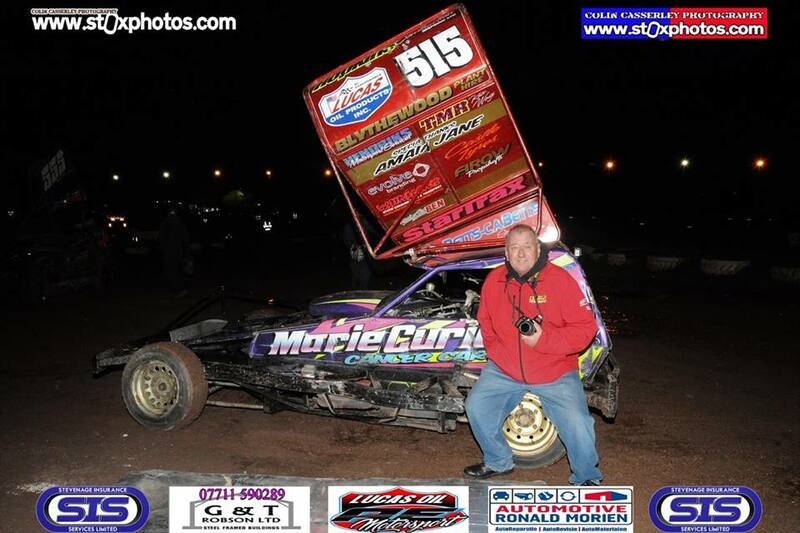 ”TColin Casserley was there , and took this pic of me beside the winning car. The racing was all over, by about 9-00 pm, which was perfect, considering the long drive we had back to Oxfordshire. On Sunday morning, (4 Nov) , I left Anne’s place for the short drive for the next racing event of my trip. 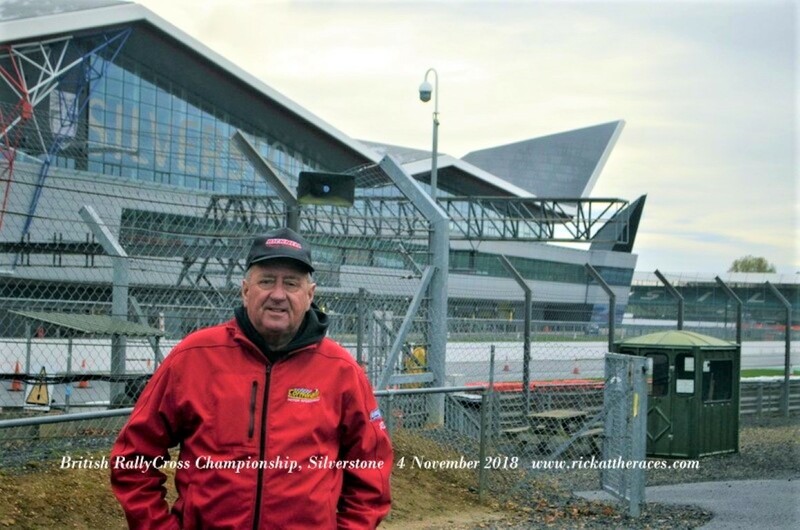 I was heading to the Internationally famous Silverstone Racing Circuit . 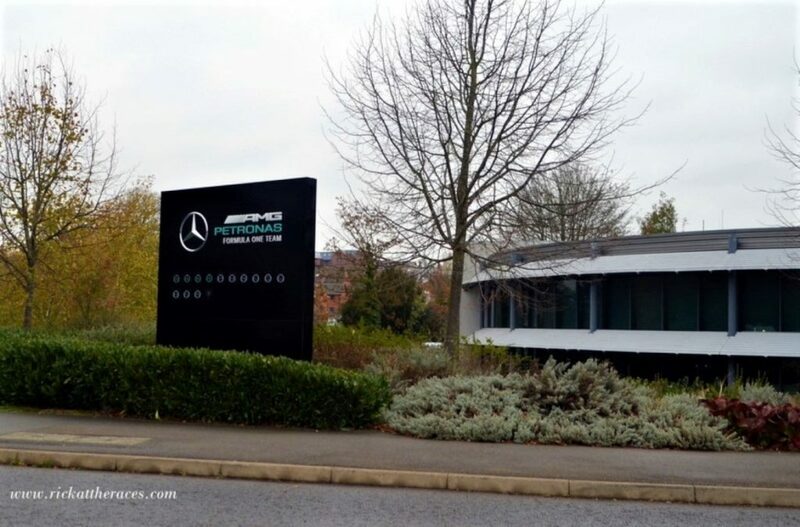 To get there I had to drive past Brackley in Northamptonshire, the home of Petronas Mercedes the Worlds #1 F1 Racing Team. 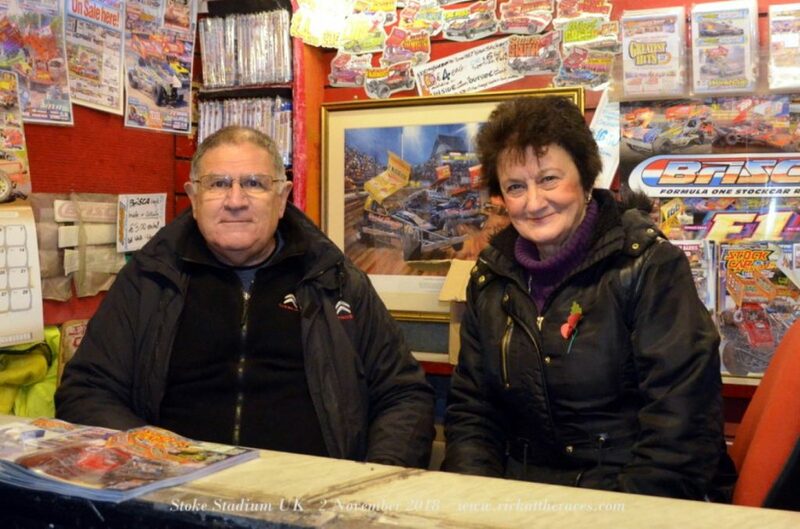 How can anyone who calls them self a race fan, not stop by and take a look. 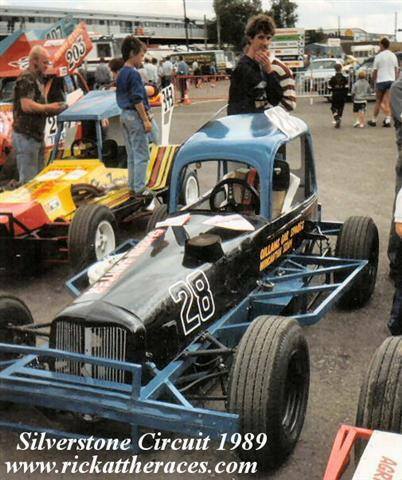 Ten minutes further down the road from Brackley and I was at Silverstone. 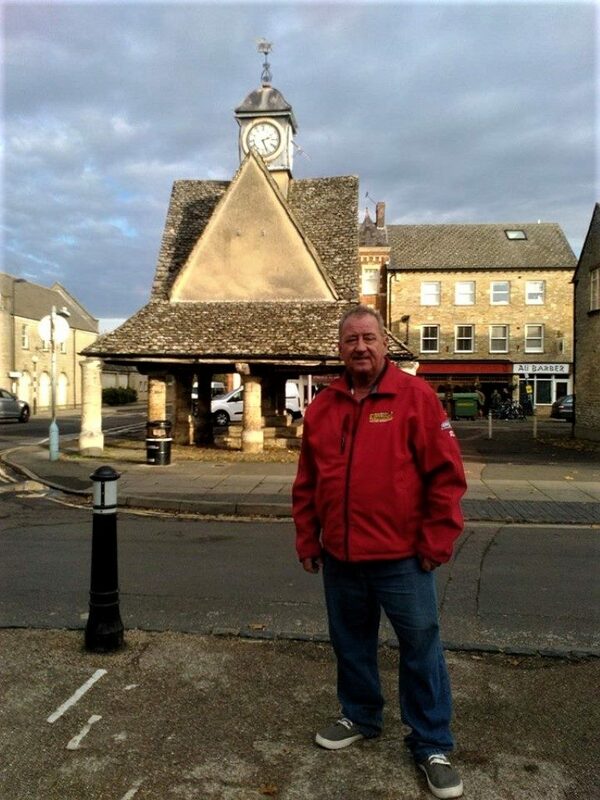 Back in the early 80’s I lived at Maidford, which is a small village nearby. I’ve been to the track many times over the years for F1 Grand Prix and other events , but this time I was going for something a little different. 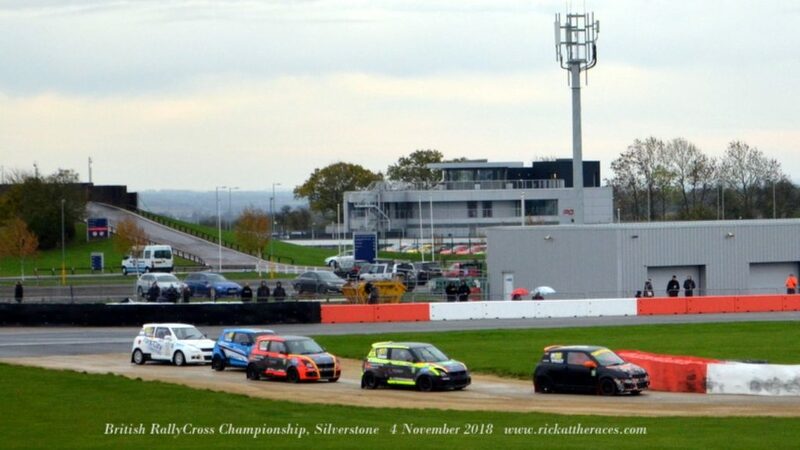 I was going to see the final round of the British Rallycross Championship, on a newly constructed special track within the Silverstone complex. This would be a new track for my Trackchasing totals. It was drizzling with rain , on and off during the day, so I watched some of the races, took a few pictures before making my exit, before the end. This became TRACK # 236 on my Trackchaser totals. On Monday I had a free day, so went into Witney for some lunch at the Angel Pub. Then some shopping and picture taking of a few of the sites in the town center . 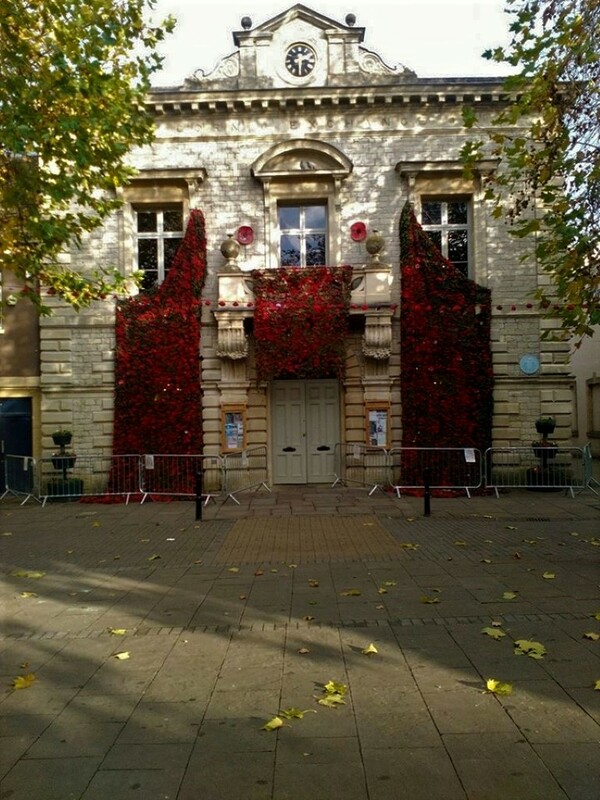 The old Buttercross in the center of town that I used to play on, when coming home from school, and the poppy display at the Corn Exchange. 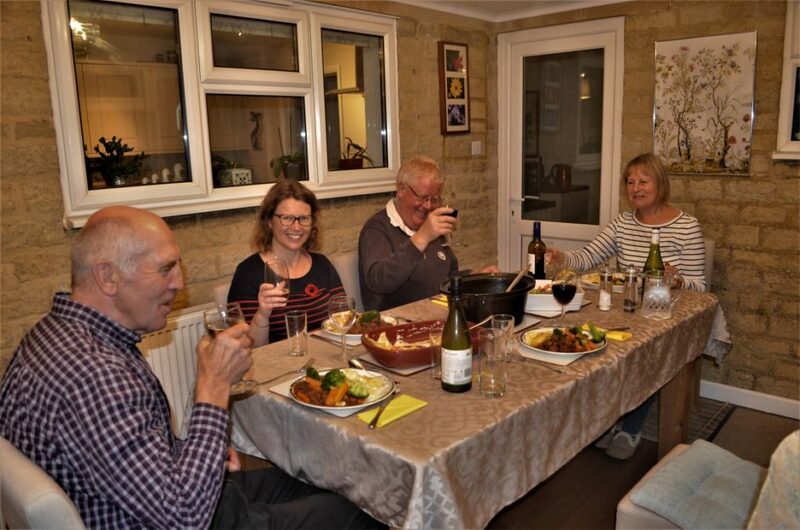 Monday evening Anne and husband Pete, had prepared a nice meal for me and two other early arrivals for the next days celebrations , cousin Jim Young and wife Michelle. 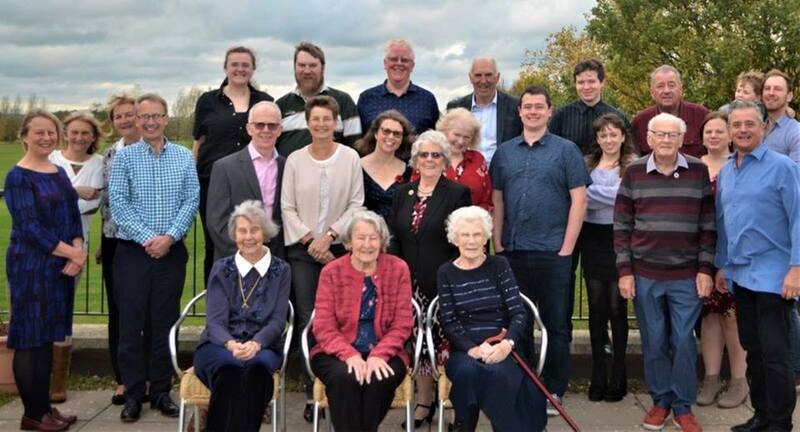 Tuesday 6th November was the big day, Mums 90th and the reason for this late in the year trip. 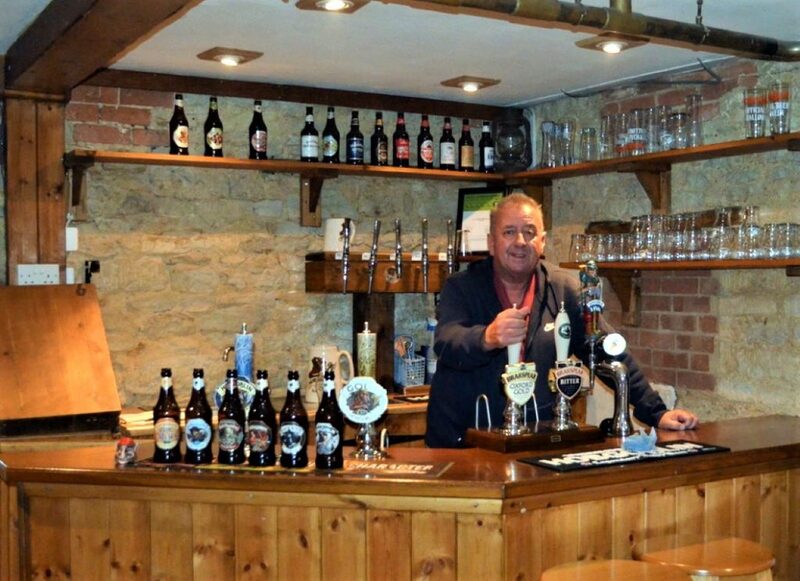 Friends and close family would be arriving during the morning, for the lunchtime party at the Wychwood Golf Club. My daughter Carla, had flown in from Austin, Texas and my long time friend, Lynn had driven up from Hampshire. Around 1-00 pm . we all sat down for the nice carvery meal. 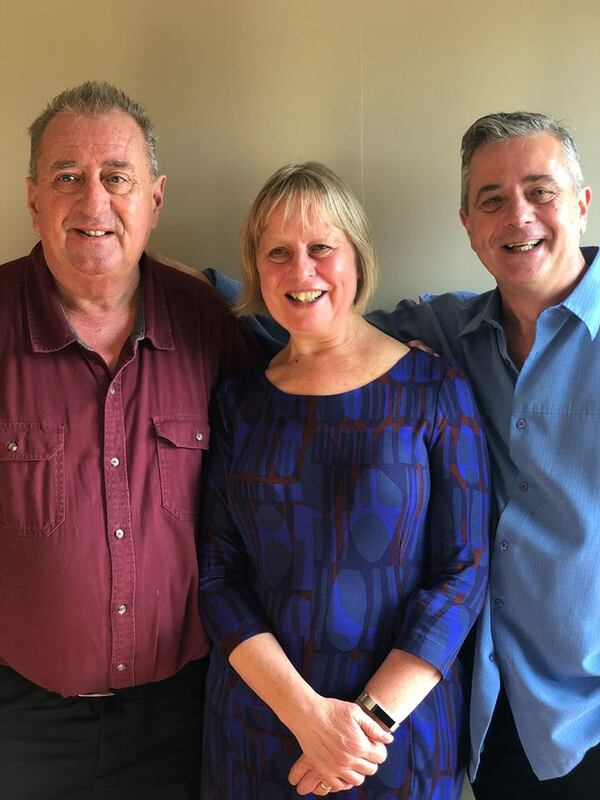 It was a great opportunity to get an up to date pic of me with my sister Anne and brother Chris. Once the meal was over, we all went outside for a group photo, before finishing off the evening at Annes place. Wednesday (7 Nov) was my last full day in the UK. 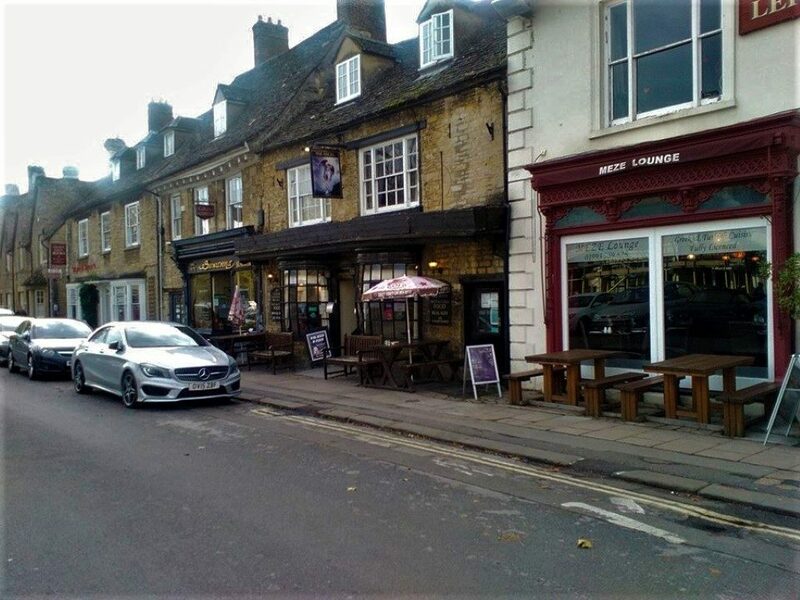 so I drove mum to an appointment in Witney before meeting up with Lynn for lunch at the Angel, before her drive home. Later in the afternoon, before returning to Anne’s I met up with Robert Sellar for a coffee in town. At 4-30 am on Thursday morning, Anne drove me to the coach stop in Oxford for my 5-45 am ride to Heathrow. I was there in plenty of time , to endure the rude and arrogant treatment of the Airport security staff as I went through baggage scanning and X Ray procedures. I know in this world that we now live in, these checks are very much needed , but there is no reason that staff should be rude and unfriendly. We were herded through like cattle, and I was bossed around as if I was a criminal. After this, everything else went smoothly and I was back in Ottawa , by about 2-30 pm. After picking up my car from the Park and Fly, I was home in Cornwall in time for supper.